Treatment lining start with the refinement of a cut in detail at the top, namely recesses on the shelves and the back. On the back sew the middle sections of seam width 1 - 1.5 cm from top to bottom and tucks from the waist line - one from top to bottom, another from the bottom up, securing the ends. On the shelves grind off the top of the Darts and tucks from the waist line. Then sew the side sections of the lining seam width 1 - 1.5 cm. Depending on the processing method and tuck the side sections can be Stacey and secured in the process connection of the lining with the top of the product. Lining priorivet on the reverse side. Before connecting with the top of the appliance specify lining on top of the product and outline marks on the sides. The upper part of the garment and fold the lining, right sides inside, equating the internal sections of podborov and side sections of the lining, combining marks. Lining pritachivajut seam 1 cm wide in the lining, Posiva her in the chest. 5Килет turn on the front side, laid out on the table lining up the edge of the Board to a working and primetyvajut for podborta along the seam primaqiune next to the line at a distance of 8 - 10 cm from the shoulder sections and not reaching a bottom line of 7 - 8 cm To clarify sections of the armholes before grinding the product lining turn down and undercut sections of the armholes of the lining, equating them with slices from the top.The product turn on the wrong side and pin it to the seam strip joints lining with podborta a running stitch straight stitch or blind stitch on emergency vehicles. Armhole grind from the side lining next to the line of smachivaniya. The product turn on the front side, straighten the edge of the armhole and spawn slanted stitches, forming the edge of the top fabric (Fig. 97). Treated openings priorivet from the lining using a moist protohellenic. Getting to handle the bottom of the product laid out on the table, lining down to check its length. Lining trimmed in accordance with the bottom edge of the top. Product turn lining up and primetyvajut stitching straight stitches with a length of 3 to 4 cm or fixed pins with a distance of 10 - 12 cm and Then the lower section of lining bends inwards a distance of 1 - 1.5 cm from the bottom edge of the top and zametyvayut at a distance of 1.5 - 2 cm from the fold of the lining. 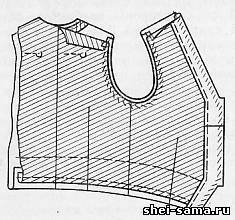 The lining hem stitching blind stitch loop-like stitches in the line of zamatyvala, forming a crease.The connection of the vest lining can be done by hand or by machine.